[Giveaway + Event] 40oz Van Exclusive Snapback Re-Release! Bonjour Lattes! So its been awhile since we’ve hosted an official Lipstick, Lace & Lattes event but *drumroll please* we have some good news to share!! This upcoming Saturday, April 27, 2013, Bronx socialite and designer, 40oz Van, will be holding an exclusive in-store re-release of some of his highly demanded snapback hats at Colors in LA. During this event, you’ll be able to purchase some of 40oz Van’s limited edition snapback hats, as well as mingle with some of LA’s hottest industry professionals, fashion elite – and the ladies of Lipstick, Lace & Lattes. Bought to you by one of Hollywood’s biggest promoters, Drew Billions, Popular Demand’s Thundercup and LLL – and featuring music spun by DJ Mike Danger – this event is one you won’t want to miss! Oh, and did we mention that there will be complimentary drinks with your ID?! Come thru! And that’s not all ladies and gents! In celebration of this wonderful event, we’re offering one of our followers the chance to win an exclusive 40oz Van limited edition snapback! All you have to do is follow the steps listed below! 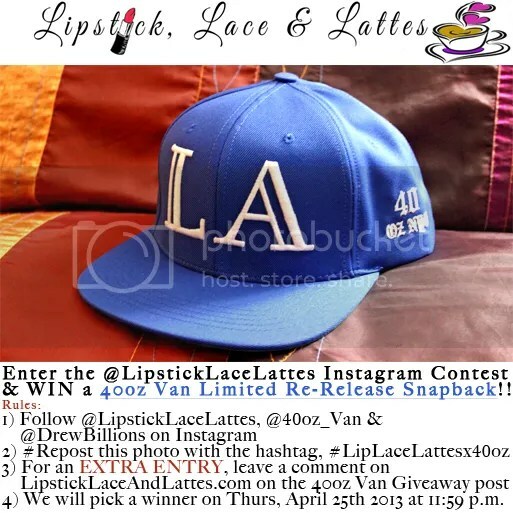 1) Follow @LipstickLaceLattes, @40oz_Van and @DrewBillions on Instagram! 3) For an EXTRA ENTRY, you can leave a comment on this post with your name, email address and Instagram user name! Mind you, this is for an extra entry only! Following the three accounts and reposting the photo on your account is mandatory! We will pick a random winner on Thursday, April 25th, 2013 at 11;59 p.m. and notify them via email or Instagram. Disclaimer: You MUST be available to come to the event on Saturday in L.A. to pick up your hat! It will not be mailed to you! That’s it! Good luck!